1. Preheat the oven to 200°C, gas mark 6. Place the onion, carrot and rosemary in a food processor and pulse until finely chopped. Heat the olive oil in a large saucepan and add the mixture and gently cook for 6 minutes, until softened but not coloured. 2. Add the mince beef and mix with the vegetables, cooking for 2 minutes until browned and breaking up with a wooden spoon. Add the red lentils and tomato purée and cook for 1 minute. Mix together the stockpot and water and stir into the pan. Cook gently for 20 minutes without a lid, until the lentils are tender. 3. Meanwhile, place the potatoes in a large saucepan and cover with water. Bring to the boil and cook for 10 minutes then add the cauliflower and cook for a further 7 minutes until the potatoes and cauliflower are very soft when pierced with a knife. Drain well and return to the pan with the crème fraîche, cheese and a pinch of salt and mash together until you have a creamy yet coarse mash. 4. 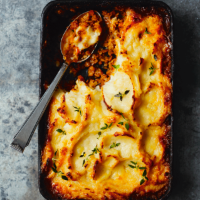 Spoon the beef and lentil mix into a 35x25cm ovenproof dish then spoon the mash on top leaving it quite rough for a crispy crust. Bake for 25-30 minutes until golden, crusty and bubbling. As an alternative, try using creamy cannellini beans or even haricot beans to make the mash. This recipe was first published in October 2017.